Congratulations to Jerry Carroll who has been elected President of the PPU for the two year period commencing March 2018. 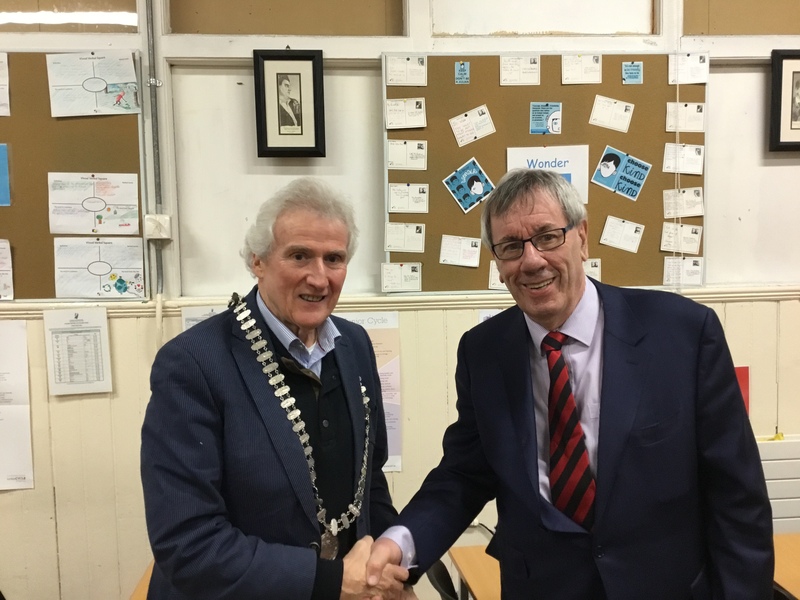 Outgoing President, Brian Duncan handed over the historic chain of office at the AGM on Thursday March 22nd in the school. Jerry graduated from the ROW in 1962 and enjoyed an outstanding career in the Civil Service in various departments. in 1998 Jerry was appointed Director of the Bar Council of Ireland and he retired from there in the last couple of years. Jerry has been an outstanding worker for the preservation and development of the school having served as Chairman of the Board of Management for many years. He was also highly influential in securing the visit of the Taoiseach for the 150 celebrations in 2015.Jerry was elected ROW Person of the Year in 2012. He is the fourth past pupil of the Class of 1962 to be elected President, surely a record which will not be beaten by any other class group. Many thanks also to outgoing President Brian Duncan for his hard work and efforts on behalf of the PPU over the past couple of years.